ONE. // WINDOWS. Our contractor fought me so hard on adding so many additional windows to his initial blue print, but I wanted endless light and I wanted it all day long. We added 16 windows to the cottage when we renovated and to be completely honest, if I could go back, I'd add more. Natural light is one of those things that just makes me so happy and that's worth everything. TWO. // THE DECK. Before renovations, our home only had a small back door (which we kept to use as the laundry room door) and even smaller concrete stoop. We decided to rip all of that out and build a large, wooden deck that would help flow the existing house into the addition. We even decided to enlarge the size of the deck that was initially drawn in the plans, simply because we knew we would spend so much time out there. We envisioned a long, farmhouse table full of friends and lights strung above to create a cozy backyard space and man, are we glad we did. We live outside and it's one of my favorite things about our home! THREE. // CAN LIGHTING. J and I both hate an overhead light. It's just so harsh and there's nothing cozy about feeling like you have a spotlight above you at all times. Sure, you need them for certain times and to do certain things, we but added can lighting to almost every room when we renovated and we're so glad we did. In addition to lamps, it's so nice to have dimmers on the can lights that will light up the entire room, but not in a direct/harsh way. FOUR. // FRONT DOOR. When we purchased @thelovelycottage, it wasn't quite so lovely. Not only did it need a lot of work, but it lacked all curb appeal. Of course, we completely renovated the exterior siding, windows, etc. because it had to be, but the front door was actually fine. It just wasn't what we wanted. We went back and forth on 'even though it's only about a $1500 commitment, can we really swing that right now with everything else we have going on and is it really that important?' Once everything else was finished on the outside, we realized the front door totally sets the precedent for the rest of the house and ultimately decided to switch it out. Worth every penny! The new front door is so welcoming + inviting and also lets even more light in. FIVE. // BEDROOM FIREPLACE. Okay, I know this one sounds a bit boujee, but if there was ONE thing on my 'please, please, please' list, it was a fireplace in the bedroom. I've always loved a cozy fire and in the house I grew up in, I lived by it. I remember my mom waking us up each morning and we would sit by the fire together before starting our day. Anyway, a fireplace in our bedroom was more important to me than a lot of things and we're both so glad we did it. We use it constantly and it adds so much to the space we live in the most. SIX. // ENLARGING THE SHOWER. Yes, it adds a little to the tile bill, but we have a great dane so enough said. The fact that he can fit in the shower easily is everything! And then J RUN gets to live his best life and Clorox the hell out of it, so it's really a win-win for everyone. SEVEN. // REGLAZING OUR GUEST BATH. A lot of people don't know that you can easily (and by you, I mean hire someone) to reglaze existing tile and make it look as good as new. We loved the white, subway tile that was original to the house in our guest bath, but it needed a little love. Rather than spending thousands of dollars to replace it, we simply had it reglazed for around $1000 and it looks brand new! 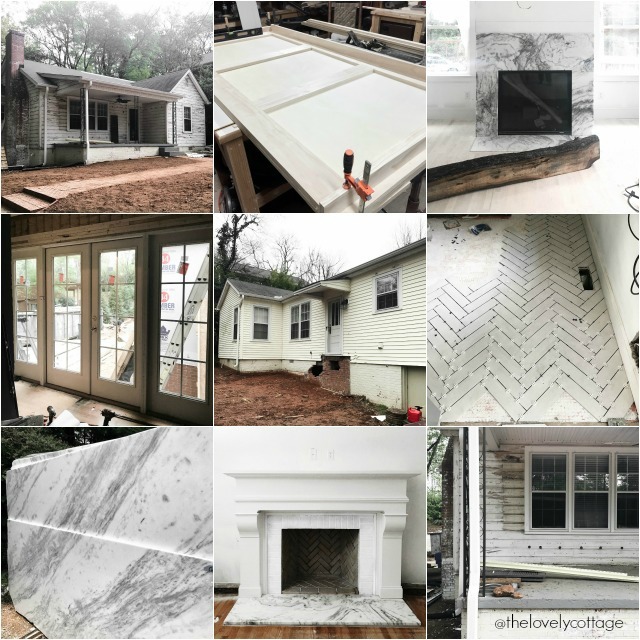 We did a quick Q+A last night on @thelovelycottage while we cooked dinner and a lot of you had so many questions about our renovations, so I thought this would be a fun post to share! Let us know if you want to see more posts similar to this or even a 'what we would change if we could go back' renovation post. Be sure to follow along on @thelovelycottage for more! Thanks so much for stopping by! X.